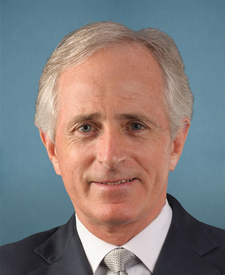 Compare the voting records of Bob Corker and Doug Jones in 2017-18. Represented Alabama. This is his 1st year in the Senate. 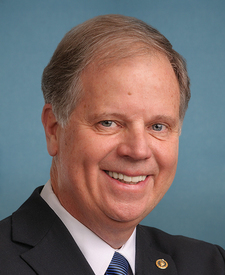 Bob Corker and Doug Jones are from different parties but agreed on 65 percent of votes in the 115th Congress (2017-18). It is unusual for two members of different parties to agree on so many votes. Out of 249 votes in the 115th Congress, they agreed on 162 votes, including 7 major votes. Jan. 19, 2018 — A bill to amend title 44, United States Code, to restrict the distribution of free printed copies of the Federal Register to Members of Congress and other officers and employees of the United States, and for other purposes. Cloture Motion Rejected by a margin of 1 vote. Dec. 21, 2018 — To amend the National Child Protection Act of 1993 to establish a voluntary national criminal history background check system and criminal history review program for certain individuals who, related to their employment, have access to children, the elderly, or individuals with disabilities, and for other purposes. Motion to Proceed Agreed to by a margin of 0 votes. Cloture Motion Agreed to by a margin of 27 votes. Nomination Confirmed by a margin of 7 votes. Nomination Confirmed by a margin of 31 votes. Nomination Confirmed by a margin of 14 votes. Jan. 20, 2018 — A bill to amend title 44, United States Code, to restrict the distribution of free printed copies of the Federal Register to Members of Congress and other officers and employees of the United States, and for other purposes.